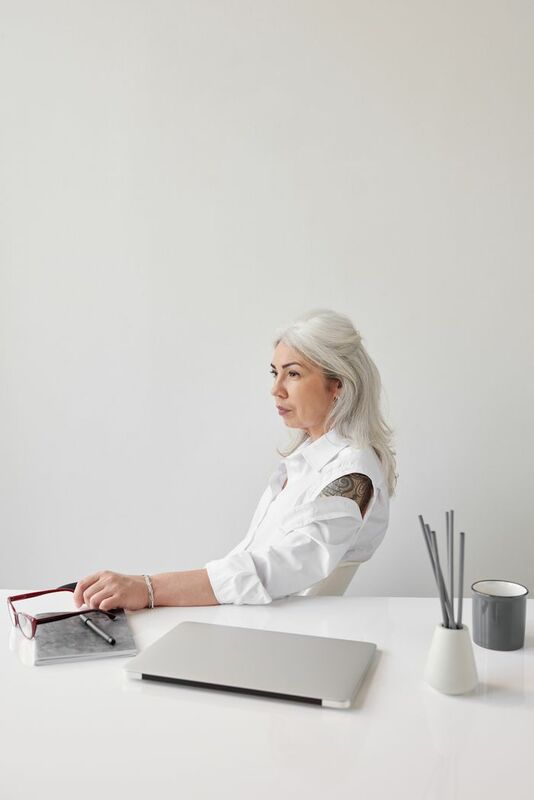 Emotions in the Workplace: Why Women Shouldn't Have to "Play It Cool"
Earlier this year I came across an opinion piece in the The New York Times titled "Where to Cry in an Open Office." The humorous listicle outlined safe locations to weep in an office with an open floor plan, including "into your poke bowl," "in the elevator," and "behind Gary, the college intern: Your crying will be obscured by Gary’s long lectures on the egalitarian benefits of an open office and how he took a class on labor and productivity, so he gets it." A woman named Jiji Lee wrote the piece facetiously, but the sad subtext underneath was all too real: The truth is that most workplaces have a "leave your emotions at the door" policy, rendering any strong expression of feeling, especially crying, inappropriate and job-jeopardizing. According to mental health experts, however, the expectation of playing it cool at the office is sexist, out-of-date, and ultimately bad for business. "If there is a bias against crying, there is a bias against women," says Laura Dreyer, a San Francisco–based licensed marriage and family therapist and the on-site therapist at Google. This is because research consistently shows that women are quicker to cry as an emotional reaction than men are. (There are a number of complex theories as to why this is.) Therefore, women will naturally cry at work more than men. There is objectively nothing weaker or less productive about expressing a negative reaction to something with tears over locking yourself in an office and shutting down—it's simply that the former is more likely to be seen in women. So, based on existing (false) ideas about women and professionalism, we disdain crying and deem anyone who does it incapable. "I absolutely think this standard of being emotionless in the workplace is sexist," comments Emily Cutler, a mental wellness coach and researcher in behavioral and community sciences at the University of South Florida. "Devaluing our emotions as merely a hindrance to productivity or sign of unprofessionalism is yet another way that a patriarchal society devalues women and femininity." Not to mention this feelings-free rule doesn't just negatively affect women—men suffer as well. "Men have emotions and are doubly humiliated if the show any vulnerability," says Dreyer. As mental health becomes a better-understood and less-taboo topic in American workplaces, some companies are offering wellness perks, like on-site yoga and meditation, and making room for employees to take more mental days. But the majority of Americans still feel uncomfortable discussing how they feel at work. According to a 2018 poll conducted by SurveyMonkey and Quartz, only 31% of American workers say they feel comfortable talking to their bosses about mental health, and a third think their bosses wouldn't find mental health a good enough excuse to miss a day of work. This rigid approach to emotions and the workplace stems from a decades-old standard—a leftover habit from the early to mid-20th century that's dying hard. "Historically, work was not fulfilling and creative, but a means of pure production," Dreyer explains. In the digital age, creativity and intellectual labor are of the utmost value, but this is very different from 50 years ago when blue-collar labor dominated the American job market. For decades, "workers were objectified and seen as resources," Dreyer continues. "Displays of emotion took away from efficient production and were very threatening to the power imbalance. Women's tears and men's anger were to be clamped down on." Most corporations are nowhere near as intolerant of emotions and mental health concerns as they once were. "We have come a long long way, and at least now we are having important conversations," says Dreyer. Because accommodating people's emotions isn't just important from an ethical perspective. As the job market shifts, it's becoming essential as a business strategy. "While it is good to be able to compartmentalize our emotions to a certain degree, more and more we are asked to bring our whole selves to work and to spend more of our time at work," says Dryer. "There is already an increasing blur between the personal and professional for everyone." Without any clear door separating work life from the rest of life, it is even less realistic to ask people to check their emotions before entering. Not to mention, emotions are actively useful for the types of creative, collaborative positions that are becoming more common in the current job force. "To be asked to lock those parts of ourselves away is, in some ways, to be asked to deny our humanity," says Cutler. "Without some amount of shared emotional experience, it can be very hard to connect with one another and form community." Not only does denying emotions make collaboration harder, but ultimately it can also have deleterious consequences. Adds Dryer, "Emotions exist, and if we don't have a healthy environment for them to exist, they intensify and become destructive." So how can bosses and employees become more accepting of workplace emotions? First, by normalizing them. "One of the main problems is that when someone cries, no one knows what to do," says Dryer. Co-workers try to pretend that it's not happening, in part out of their own discomfort, and the one crying feels ashamed and isolated. "Teaching people that it is okay to notice, acknowledge, and respond with compassion when someone cries would help everyone process the experience in a healthy way," says Dryer. "Maybe share an antidote of one your own vulnerable moments at work. It might even increase morale for everyone." That sense of working through something together can be powerful and ultimately better for team camaraderie. Cutler agrees that using emotions, rather than denying them or criticizing them, is ultimately healthier and more productive. "Companies [should] begin viewing strong emotions as an opportunity to foster connection and community among employees, rather than a crisis that needs to be shut down," she says, adding that there are many mental health training programs corporations can hire, like Emotional CPR and Intentional Peer Support, to teach employees how to connect to and support others who are dealing with distress or strong emotions. Establishing an official and accepted mental health day policy is another helpful thing companies can do, says Cutler, as is providing a welcoming space in the office to take breaks throughout the day, "such as a quiet room where employees can go during the breaks if they need a peaceful pause." That way, no one has to cry into their poke bowl or behind Gary, the college intern. Next up: six myths about millennials and mental health you probably believe are true.